This is WordPress plugin version of Fbar PHP demo bar. This plugin suitable for web designers, web developers and all marketplace authors. 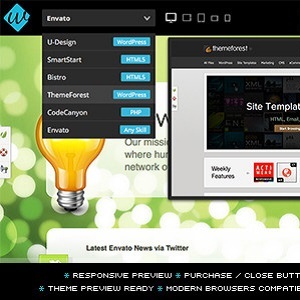 If you are theme designer or developer and if you are sell your works on Envato, I think this plugin very important for you. FBar WordPress plugin comes special overviews like; limitless color combinations, logo and favicon uploaders, enable or disable responsive mode, enable or disable purchase and remove iframe button, social media share buttons, limitless item demos and much more. So, you can show your WordPress themes, Joomla templates or HTML templates with our awesome FBar WordPress theme demo bar plugin. If you want see any demo for this plugin click live preview button. 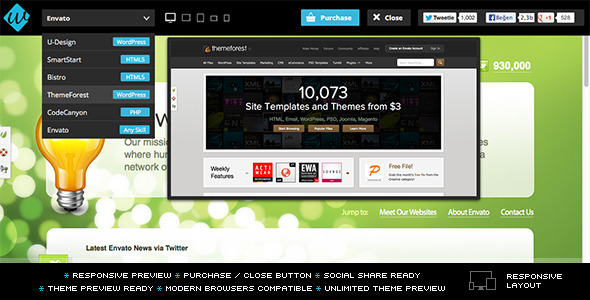 This is a theme demo bar would be shown on top of page, allow users to preview another theme. You can create wonderful demo bar or theme switcher using this WordPress plugin documentation for you even without needing to know programming or coding!